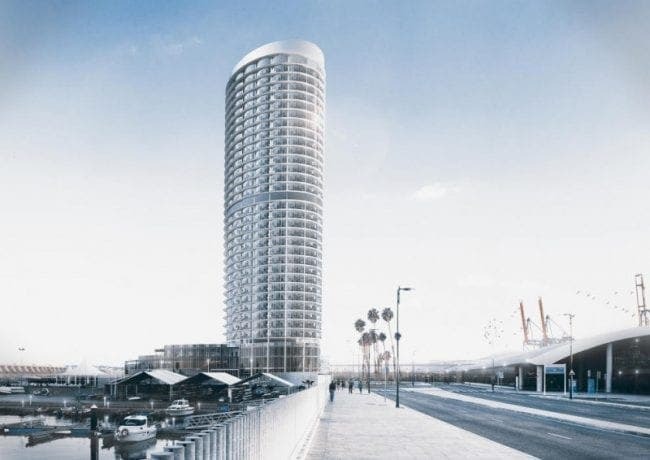 SOME 300 Malaga locals have protested against a planned hotel and skyscraper in the city’s port. Led by activist group Defend Our Horizon, the march was joined by political parties Podemos, Izquierda Unida and Malaga Ahora. The group are demanding more consultation on the project, which they say will only benefit the wealthy few. The movement has the support of 35 organisations and with ‘many people who are collecting signatures – already exceeding 6,000 – and a hundred volunteers who are on the street trying to convince people and even informing them because many do not know and we are finding lots of support,’ added Trivino. Qatar-based Al Bidda Group was given permission to build Suites Malaga Port, the name given to the skyscraper hotel last year, on the jetty that outlines the eastern side of what is one of the oldest continuously operated ports in the Mediterranean. While the initial proposal solely involved a skyscraper hotel, it is now believed a casino is also a part of the project. Suites Malaga Port will reportedly have 352 rooms, parking for 485 vehicles, and feature a casino, spa, luxury shopping centre, conference centre, and swimming pools. If the project goes according to plan, the new hotel will create an estimated 1,300 construction jobs, with 350 additional jobs when it opens in 2020.